Well, once it's officially Fall, I no longer like to wear summer colors. But I'm not going to wear blanket scarves, tall boots, and sweaters in eighty degree weather either. So on this beautiful sunny 68 degree day I chose a long-sleeve yet very lightweight dark floral dress to wear to church. My dress is from a Stitch Fix that I received last year. I previously showed it to you in THIS POST with leggings, booties, and a vest; but this is my favorite way to wear this dress...bare legged with sandals. The dress has lightly scattered blue and pink flowers and a very pretty eyelet detail all the way up the arm and shoulders. I carried a pink clutch to pick out the pink colors in the flowers. My light blue sandals from Francesca's (old) pick out the light blue color in the flowers too! Every time I wear these sandals people comment on them. They are definitely a statement piece. Francesca's really does sell the most unique shoes. You just have to remember to look down when you're shopping in one of their stores. They put their shoes on the floor underneath their clothing. Both times I've worn this dress, I wore it with a choker. This time I chose a black velvet choker with a blue stone. I also chose blue stone earrings and chose not to wear a bracelet because my sleeves are so long they would cover up a bracelet. Because of my long torso and long legs, most dresses are to short on me (but I wear them anyway otherwise I'd never be able to wear a lot of dresses). This one is a nice length for me; not too short at all! Shift dresses are my favorite because I do not have a waist. A lot of women dislike shift dresses because they are so shapeless, but if you have a shape like mine (where your middle is the same measurement as your bust and hips), they are perfect! So what's the weather like in your neck of the woods? Have you been able to bring out the blanket scarves yet, or are you still wearing sandals like me? I'd love to hear from you! So gorgeous, Amy, this really suits you and looks like an instant fix of prettiness. Love the blue shoes you've picked for their match to the flowers. We had one of those autumn last year. This autumn is a bit mixed, I wore a summer dress yesterday and today will definitely be jeans and a cardi :-(. Thank you! My husband really liked the look. The dress got very wrinkly at the end of the day. That's always so frustrating when garments do that. As a shoe girl, I am loving this pair!! I have that problem at Francesca's because there is so much stuff in such a small area!! But these were definitely a great buy!! Thanks Jodie! They have the cutest olive green booties right now that I have my eye on! Thank you! I just changed my closet from spring/summer to fall/winter last week, so this was the first time I wore dark florals too! Love how you styled the dress with the sandals. Great look! We have Summer weather here too, although it does get a little chilly in the mornings, but 80's in the daytime. We haven't had rain since the end of July...supposed to rain on Sunday, of course the day we want to go to an outdoor art fair. Thank you! We've had those chilly mornings too all through August but Friday it was still in the seventies when I woke up! Wow! No rain since late July...that's awful! I wish I could send you some of mine. We got so much rain this year the mosquitoes have been terrible. Hope your crops have been doing ok. I agree when the sun is shining leave the boots and scarves for later! You look gorgeous in this dress! I just love dark florals for fall! This dress looks amazing on you! The weather here is so nuts too. This week it's actually in the 70's, but next week it's back to high 80's...ugh it's so hard to get dressed these days. I love this dress on you, it's the perfect transition piece! Thanks Shauna! Transitional seasons are so hard! 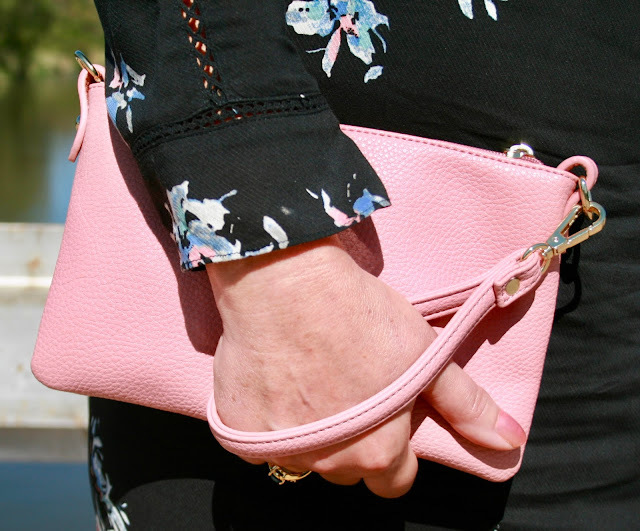 I love the dark florals and it's so pretty paired with a pink purse! The weather has been the same here, but humid too! Love this dark floral on you, and those wedges are beautiful! That dress is beautiful! Perfect for a warm fall day! And I absolutely love those shoes! Thanks Jessica! These shoes are always a hit! That dress is so pretty on you! I love your sandals! Love your dress and those gorgeous sandals! We've had quite a bit of rain in the UK, and grey skies. It's that kind of weather where you have to go outside to see what the temperature is because it looks colder than it is. Thanks for linking up!